Mother Nature may have had other ideas, but my friend Tracy and I didn’t let her interfere with our running plans! Monday was such a gorgeous day until the late afternoon storms hit… My last client and I were scheduled to meet at 6:15 PM but we canceled our appointment because we were under tornado warning. What started as a 15-minute warning stretched into 45 minutes as I hunkered down in my basement away from the windows and Bill pulled into a parking garage somewhere between his office and our home. Tuesday, around 2 AM another round of severe thunder storms hit. The lightning was almost constant and our bedroom was so bright that I rolled over and told Bill that I needed my sunglasses. 😎 Those storms kept me awake for a while, but eventually I went back into a fitful sleep aware of the booming thunder hanging over our house. At 4:15 I woke up to yet more thunder, lightning, and heavy rain rolling through. At 4:30 I looked at radar and saw that the storms appeared to be moving out so I got up. Tracy and I texted back and forth confirming that we were still meeting on the hill for repeats, but our three other friends opted to move their hill workout to Wednesday. 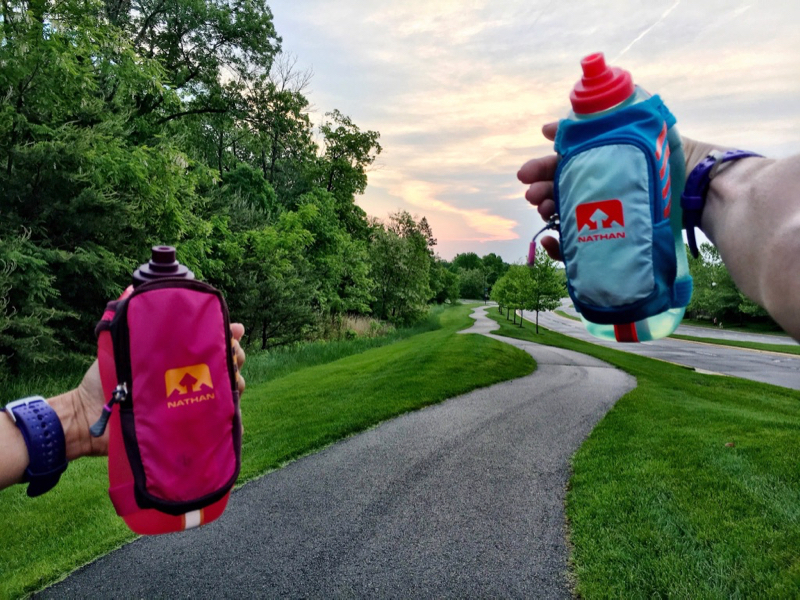 By the time we met at the parking lot the rain had stopped, and at the end of our run we toasted to a beautiful morning with our Nathan water bottles (affiliate link)! My work day started a half hour earlier than usual on Thursday, and in turn, I had to run earlier. Not surprisingly, my friends chose to not meet me at 5 AM so I ran in my neighborhood. About twenty minutes into my run the light drizzle turned into heavy rain, a refreshing break to the humid morning air. On Saturday, day eight of rain, Tracy and I opted to meet at 8 AM hoping to avoid the earlier morning rainy forecast. 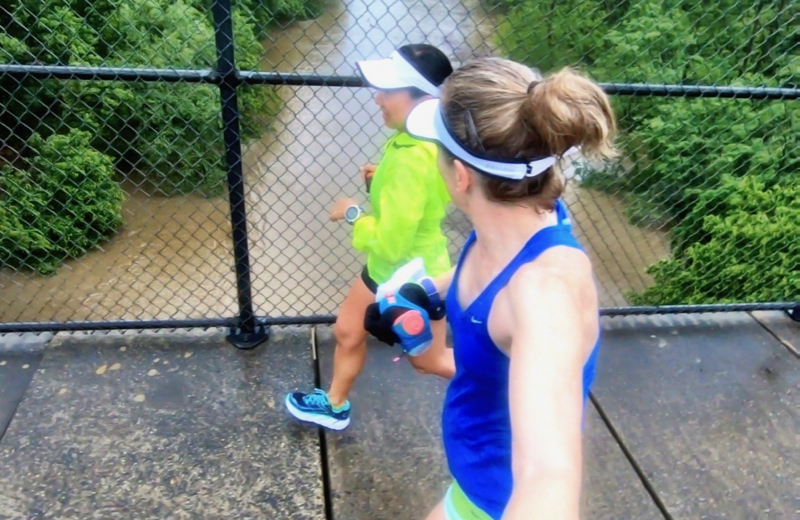 Our plan didn’t work and we ran in rain for a good portion of our 8-mile run. That actually kept things cool and we had a delightful run. Goose Creek was muddy and flowing strong, but not as high as I expected after all the rain we’d gotten throughout the week. Back home, I showered and patiently waited for the kids to arrive! Last weekend Joseph and Daniel surprised me for Mother’s Day with a Saturday visit, but this weekend had long been on the calendar and Julie and Jess would be joining them. Pablo is now completely at home at our house and bounds in with authority. He’s so excited to see us and loves being the center of attention. 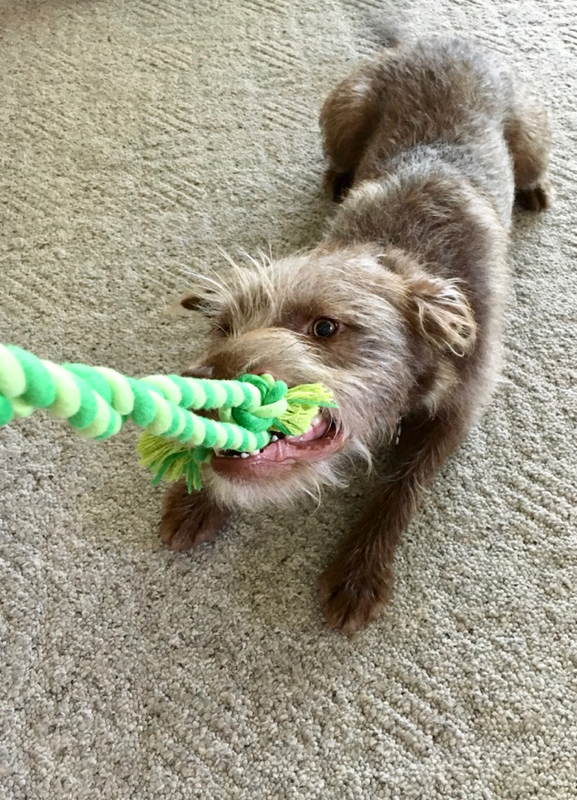 He loves fetch and tug-o-war, and has reduced his toy rope dog into a long straight rope. I tried a new grilled and stuffed avocado recipe for dinner and it was a good as it sounds. I’ll share the recipe in a later post when I have time to take decent pictures. We’d planned to make s’mores for dessert, but it was damp and drizzly and it just wasn’t a night for sitting around the fire pit. Instead we went to a new Italian ice place that just opened up and we all opted for chocolate/vanilla swirl soft serve. This funny sign was on one of the soft serve machines. Has it been rainy or dry where you live? It’s been a really rainy spring this year, although this week wasn’t too bad. Until the weekend. We used to have a joke when we lived in VT — what follows 2 days of rain? Monday (cause it always seemed to rain on the weekends). Good job getting it done despite the wet stuff! Everyone seems to be stuck in the rain this spring! I’m so over it. I guess it wouldn’t be so bad if it were a bit warmer! Bingo! It didn’t even get out of the mid-60’s a couple of days this week… Today has been sunny and got up to 86° briefly! This was my first time grilling avocados. I’m so glad I found the recipe! Surprisingly, Iowa (at least where I’m located) seems to have missed all the rain that has been pouring down on everyone else. We had pretty much daily sunshine last week (I probably jinxing my week by typing that LOL). Yes rain. I ran a half in it yesterday. Hoping we both have some sunshine. Ugh, I hope you still had a fun race! That grilled stuffed avocado sounds delicious! I am not a huge fan of soft serve. I like the hard icecream with chunks of sweetness such as brownie bites in it. The grilled avocados were so good – I made them again last night! We’ve had quite a bit a rain here but thankfully it’s been broken up with nice days too. Today it was so humid. I felt horrible for my friends who bonked during their goal races today. What a bummer to have race day turn out hot and humid. 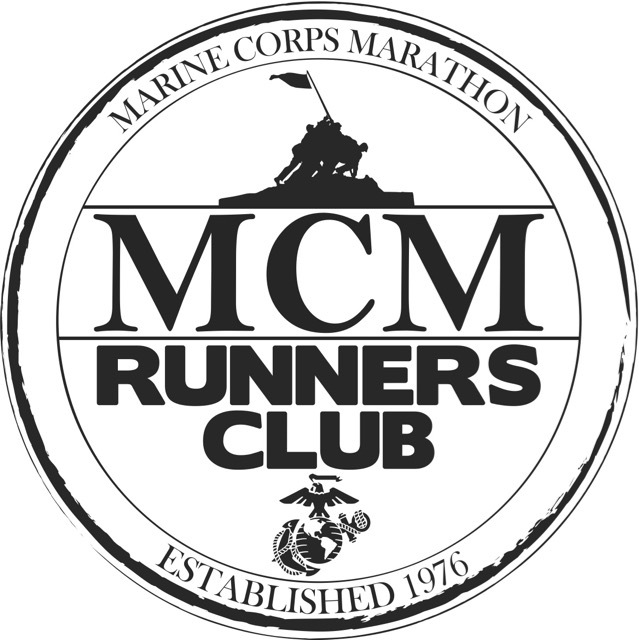 It reminds me of last fall’s Army 10-Miler which was eventually deemed a fun run due to the horrible humidity. Rain, rain, rain here. I did a trail run last weekend that turned into more of a mud run. It was ridiculous, but fun! Sometimes you just have to let it go and play in the mud like a kid! We were supposed to have rain all week but it just didn’t happen. It stayed further east ;). I think it would have been less humid here had it rained. 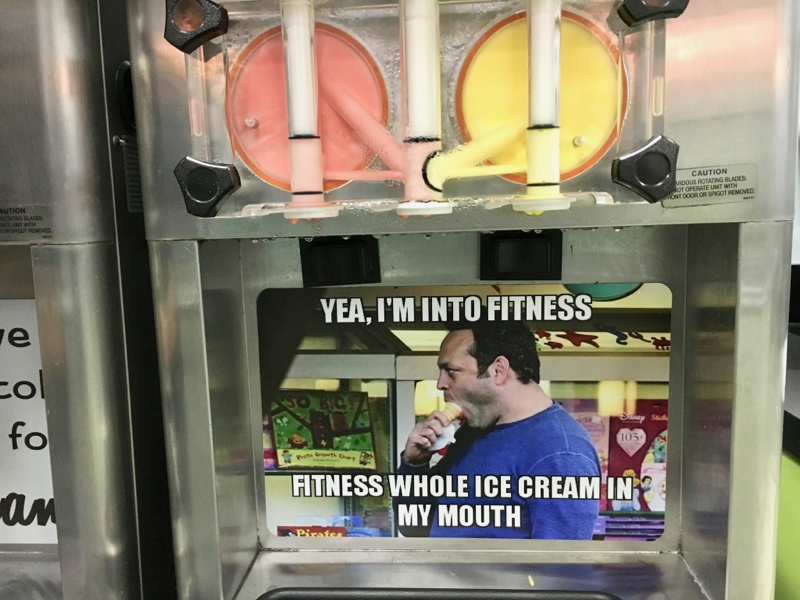 I can pass on the ice cream, etc. But warm cookies? Moist cake? No can do. Thanks for linking. It seems like most of us had very rainy and crazy weather last week. Hopefully it’s over now! Sunday and Monday were nice, but today was pretty rainy. Our creek is flooding its banks again! 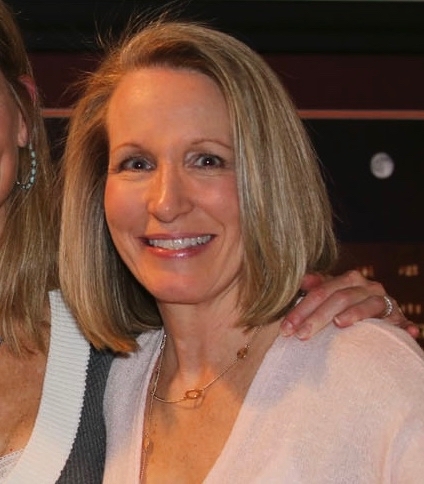 How do you find the handheld water bottle, does it chafe you? Still trying to find the right one. PS: I need an Ark! Thank you – it’s fun playing in the mud! I do like my handheld water bottle, and no, it doesn’t chafe. I used the waist belt water bottles for many years, but eventually that started bothering my back. Of course, I need to run near water fountains if I’m on a really long run since my bottle only holds about 20 ounces. Wow, it has been a wet year for you so far! Here we haven’t had much rain. Now that the temp is in the 80-90°F’s the storms are coming through more often. Not much rain though! Just an occasional downpour with the storm. 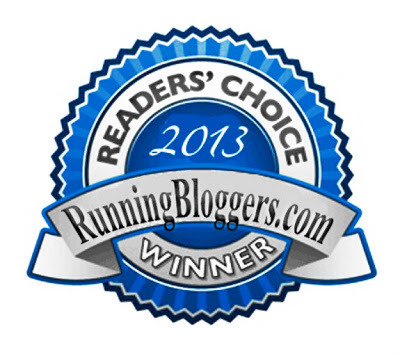 I like running in rain as long as there isn’t lightning or tornados! 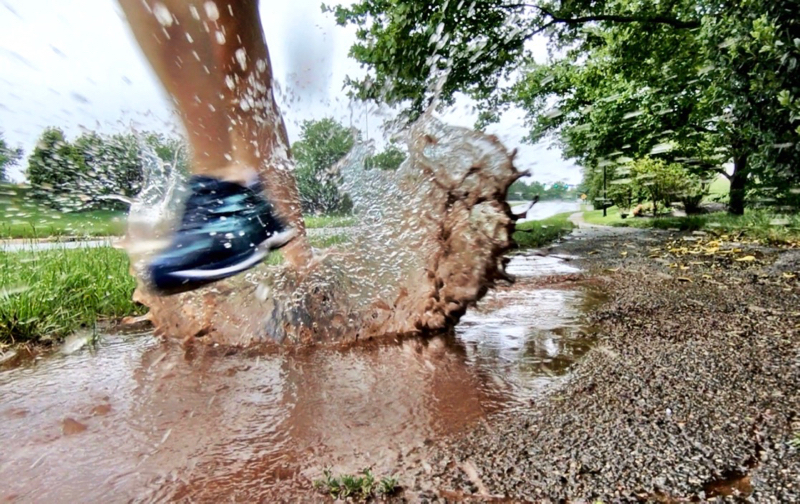 Yes, it’s always smart to play it safe when running outside! Kudos to you for being a dedicated runner 🙂 Instead of being scared of running in the rain, we should embrace it. If done right, it can be one of the most fun training experiences! I love running in the rain as long as it’s not a cold rain – I’m not fan when it’s 40° or colder.